Shoulder Impingement is a common shoulder issue. It often occurs due to too much wear and tear of the tendons in the rotator cuff. The gliding of the rotator cuff is usually smooth. When you have an impingement, the bone on top of your shoulder (acromion) can rub on the tendon and your bursa (lubricating sac between the rotator cuff and acromion). This is why you would feel pain from lifting your arms if you have an impingement. Other times, you may feel shoulder pain if your rotator cuff tendons are irritated also known as tendonitis or if you have bursitis, an inflamed bursa. Wearing a brace to stabilize your shoulder is important for healing if you feel that you have an impingement issue. As always, see your physician or a physical therapist for serious shoulder injuries. 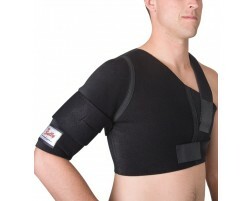 Need help selecting a brace for shoulder impingement?